Upcycling is the process of repurposing existing materials, rather than manufacturing new ones, in order to create an entirely new product with added value. Like recycling, this process reduces waste by keeping sturdy materials like metal, glass, rubber, and vinyl out of landfills and put to good use again. 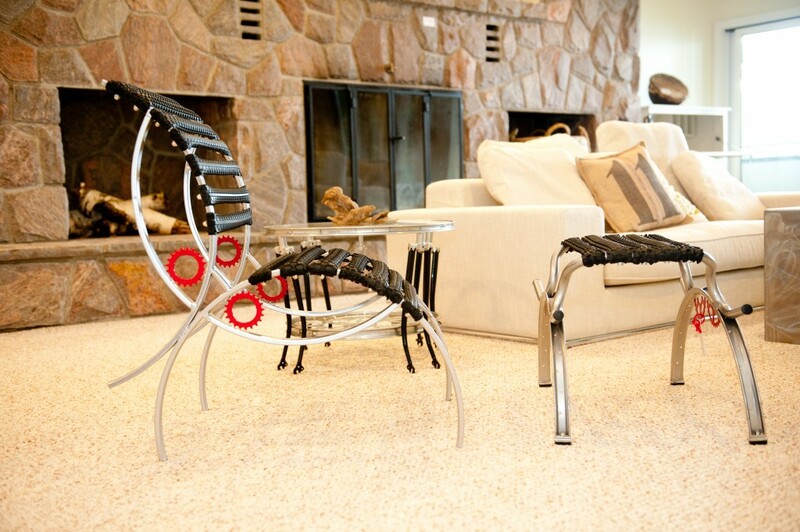 With roots in the artistic tradition of found objects, upcycling has always been an intentional choice by the artist. It elevates the purpose and status of items typically considered trash. As a result, artist and patron can both participate in a political statement in support of environmentally sound practices. The artisan craftsmanship inherent in these pieces is unmistakable. Rather than hiding the “old life” of scrap materials, they are thoughtfully reimagined as the centerpiece. The stories that accompany upcycled products are more evident, as the creative adaptations of materials are prominently featured. Exclusively at Donjenna, we have a fabulously curated section of products that proudly feature this unique process. From tables and benches to glass light pendants to other lighting fixtures, these pieces add an unexpected element to your space while keeping the overall style light and contemporary. Check out some key pieces below. 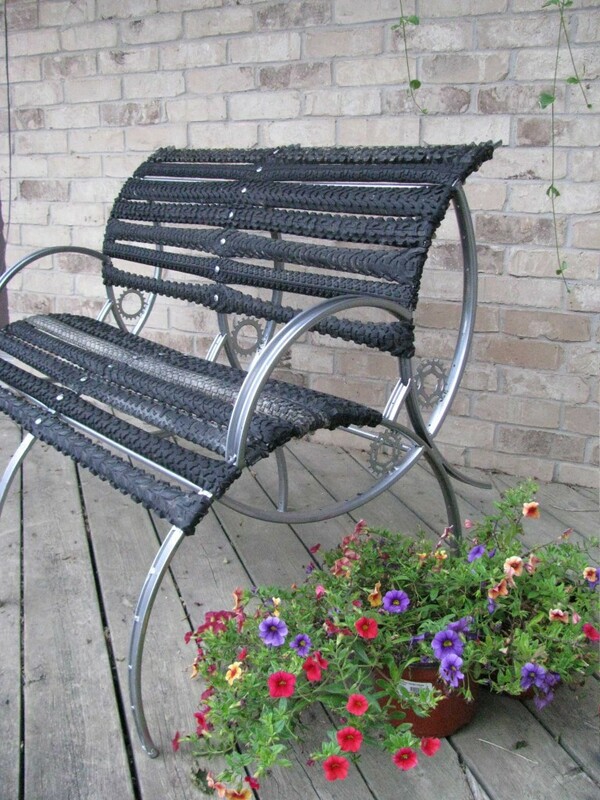 The Recycler’s Tread Bench uses bicycle rims, sprockets, and heavy duty tire tread to create a one-of-a-kind outdoo r bench. Browse more of his stunning designs here. Artist Kathleen Plate composes each elegant glass pendant light by hand using recycled glass. 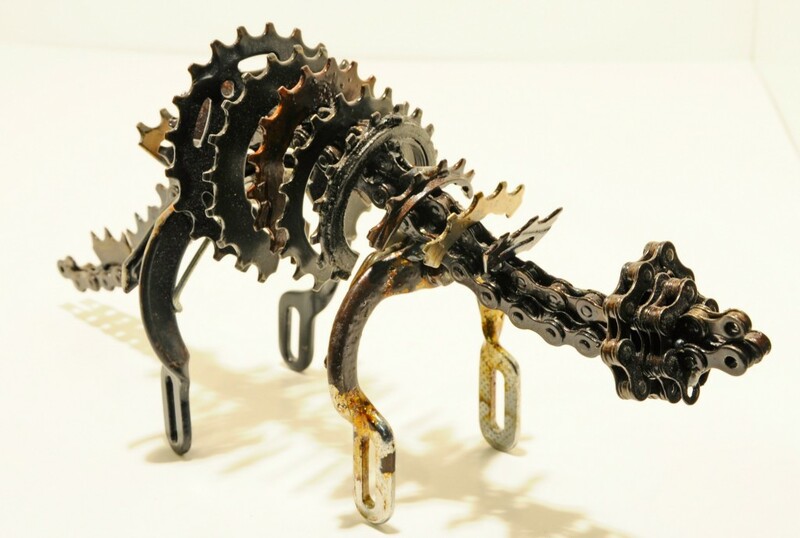 This whimsical dinosaur desk sculpture, fashioned from bicycle chains, is another hit from The Recycler. donjenna is an exclusive source for bespoke and handcrafted art décor. We cross the globe to create partnerships with previously undiscovered artisans. From our robust e-commerce gallery, we display and sell superior quality modern and contemporary items to discerning interior designers, architectural firms, and consumers. This entry was posted in Inspiration Blog and tagged art, artisan, bespoke, bicycle parts, desk sculpture, dinosaur, glass, glass pendant light, handcrafted, Kathleen Plate, metal, outdoor, outdoor seating, pendant light, The Recycler. donjenna is the exclusive source for bespoke, handcrafted art décor. We cross the globe to bring the stories and works of skilled artisans to discriminating interior designers, architectural firms, and consumers seeking the perfect piece to transform their environment.